We are less than 2 weeks away from the beginning of the Rodriguez era! Unless you've been under a rock for the past 5 or so years...this is exactly what all the Lloyd-haters have been waiting for. I myself liked Carr and thought his program was pretty good. He ran it clean and kept his players out of trouble...for the most part. Say what you will about inexperience, we have a ton of it. And say what you will about how bad Michigan will be in this first year of running a new spread offense. It's no mystery to anyone that this will not be the same Michigan program as in year's past. But for the first time in a long time, long-time Michigan fans are actually starting to feel that what Rodriguez is doing, is really special. No longer can you blame Carr/DeBord for the stale offensive play-calling. In the time it took Michigan to run 3 straight draw plays last year...this year, they will have probably had two different QBs, a direct-snap to the RB, a flanker screen to the weak-side, and maybe even a 5-wide set with a double-reverse. All the while not stopping to huddle once. And that idea is what has so many Michigan fans eager for Utah on August 30th. As it stands right now, Steven Threet is the presumptive starter. But recent news is that Nick Sherridan is getting a very hard look with the 1st team offense in 2-a-days. Rodriguez has a history of not disclosing his starting QB until gameday. And this could be exactly that. But if he decides to go with a 2-quarterback system, it bodes well that he says he really likes what he sees from his two front-runners. Nick Sherridan is a red-shirt sophomore walk-on who just recently was awarded a scholarship. Threet is a red-shirt freshman transfer from Georgia Tech. Another source of excitement in Ann Arbor is the surge of freshman Sam McGuffie. Not only has he had more hype than any RB to come to AA since Justin Fargas in the late 90's, apparently he's been able to live up to it too. McGuffie adds a huge element of speed and agility to this offense that is so desperately needed. With Brown and Minor resting a couple small injuries (nothing that should impede their start against Utah), guys like McGuffie and Shaw could see a lot of playing time early. Michigan's media day was over the weekend. Photo galleries here, and a whole ton of University owned content here, and here. 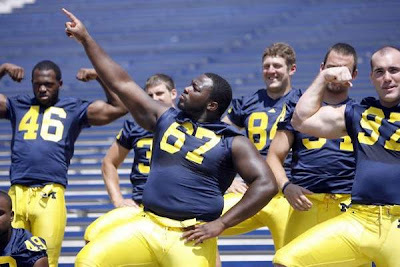 Also in the news, Michigan begins the season unranked in the AP poll for the first time since man has walked upright. I can't say I am surprised, as I would also not rank them in my top 25, it just hits home a little harder when you see it in print...and tOSU fans won't shut up about it. More on the way, including a Q&A with Utah blogger, Block U...and a in-depth preview of the Utes from yours truly.